I was only reading this memorial stone this week as I walked through the park, I had never known it was there. This postcard of the Town Hall gardens shows them as "Pembroke gardens". I've never heard them called this before, does anyone know if this name was ever officially used? "One of the vilest episodes in Saint Martin's was the sermon preached by the Reverend Wakefield Marriot on August the 10th 1834 after the execution of Private Benjamin Gardiner of the 50th. for the murder of his sergeant, Patrick Feeney. It would appear that this killing took place in a fit of drunkeness and Marriot berated his congregation about the evils of drink, whilst revelling in the supposed thoughts of the condemned man on his way to the gallows. In mitigation, Marriott lost a daughter Emma at seven months and another Agnes at nine months. He was a sad man." Execution of Gardiner the Murderer. Chatham, Thursday, July 31 - This day, a little before noon, the sentence of the law was carried into effect upon Benjamin Gardiner, aged 29 years, a private in the 50th Regiment of foot, who on Friday last was convicted of the wilful murder of Patrick Feeney, the sergeant of the grenadier company, to which he (the culprit) belonged. The platform was erected during the night on the lines, at the margin of the trench which separated the lines from the ramparts, upon which the military were principally to be stationed. The different corps brought were, the 50th Regiment of Foot (to which the culprit had been attached), the 17th Regiment of Foot, the Royal Marines, and Marine Artillery, beyond which small groups of soldiers belonging to other regiments were stationed on the heights which overlooked the ramparts. About 2,000 men appeared with their officers in full uniform. The prisoner left Maidstone at half-past 9 o'clock, in a post-coach, accompanied by the rev. chaplain of the county gaol, and two turnkeys armed with loaded blunderbusses. Calcraft, the London executioner, travelled outside the box, armed with a similar weapon. The prisoner was double-ironed, and his arms and wrists bound, so that escape and rescue were impossible, had they been contemplated. The cavalcade consisted of two other coaches, containing the sheriff, his deputy, and other municipal authorities, preceded by several officers on horseback. At 11 o'clock, a wagon proceeded a mile from the end of the town on Maidstone Road, when the prisoner was removed into it, and from thence he was conveyed to the place of execution, accompanied by the executioner and the two turnkeys. The crowd which preceded and followed the cavalcade was immense, and when they joined the vast concourse previously assembled on the ground the multitude must have amounted to from 10 to 12,000 persons, independent of the military, but the greatest order prevailed throughout. During his passage through Chatham and Brompton the criminal gazed around him, and occasionally gave a nod of recognition to some of his former companions; but while he manifested undaunted firmness he betrayed no symptoms of levity. When the wagon had been drawn near to the platform the clergyman again joined the culprit and read portions of Scripture and united with him in prayer, to which the unfortunate man paid the most profound attention. When he ascended the platform he loosened the cord which had supported his fetters round his waist, and threw the cumbrous burden at his feet, at the same time requesting the executioner 'to be quick.' When the cap was put on his head, he desired that it might not be drawn over his face immediately, as he had something to say. After the rope was adjusted, he expressed his contrition in the following laconic address: "Gentlemen, I am guilty of the crime for which I am about to suffer, and I'm sorry for it." After a pause, he added, "I beg also to state, that unless it had been for drink, I should not have been here to-day, I dare say." These words were uttered in a firm tone, but not sufficiently loud to reach the ears of the spectators, who were kept at a considerable distance from the platform. The signal was then given by Mr. Under-Sheriff Wildes, and at 20 minutes to 12 o'clock the platform fell. Owing to the weight of his fetters, the sufferings of the malefactor were of short duration. After the body had been suspended for an hour, it was cut down, and conveyed in a coffin to Maidstone, in order to be buried within the precincts of the gaol, pursuant to that part of the sentence. The malefactor has been a person of extremely bad character, and was in consequence drummed out of the Marine artillery, to which corps he was once attached. He has been in the 50th Regiment for about two years, but his company was shunned by the generality of his companions. I may have a look to see if i can find Patrick Feeney's gravestone in the cemetery(town hall gardens) sometime. The public interest was so intense in this county respecting the recent murder of Sergeant Feeney by a private, whilst on parade at Chatham, that the court was crowded long before the Judge took his seat, and it was not without great difficulty access could be procured for those who were professionally engaged in the case. Benjamin Gardiner, aged 29, a private grenadier in the 50th Regiment of Foot, was placed at the bar, charged with the wilful murder of Patrick Feeney, the sergeant of the regiment, by shooting him whilst on parade at Chatham, on the 9th of the present month. Mr. Espinasse conducted the case for the prosecution, Mr. Bodkin appeared for the prisoner. George Hewer examined, - I am a sergeant in the 50th Regiment now quartered at Chatham. I knew the deceased, Patrick Feeney. He was sergeant in the grenadier company in the same regiment with me. Prisoner was a private in that company. On the 9th of the present month there was a private parade, at about half-past 4 in the afternoon. The parade was in the barrack-yard at Chatham. At private parade it is not usual for privates to have flints in their muskets, unless ordered. They never go on parade loaded. There was no order tat day that men should have flints in their muskets. I saw the prisoner at that parade. He was in the ranks. Sergeant Feeney, the deceased, had to inspect the company. I heard him give an order. After inspecting the company he closed the ranks, as usual. He ordered the prisoner to take two paces to his front. The prisoner did so, Feeney gave him the order "Right about face". Prisoner obeyed, and in doing so staggered. Feeney then gave the word of command, "Left about face," which was immediately obeyed. The prisoner's musket was then in the position of 'shoulder arms,' standing up with the musket in his hand. The deceased then called the corporal, and ordered him to take the prisoner to the guardroom. The prisoner, as soon as the word ?guardroom? was mentioned, threw his firelock from its loading position, and at the same time cocked it, pointed the muzzle of the firelock towards the deceased, and fired. The deceased bent down on his knees, and, in the act of falling, called out "Oh I murder." When the musket was discharged, it was in the loading position, and it was raised one inch. I went p to the prisoner and ordered him to come to the guard room, and I with two corporals took him there. While we were going the prisoner said, "I have just rid the world of a rascal and a tyrant, and I am ready to die for it." The prisoner was put into the black hole adjoining the guardroom. He then turned about and looked at me, and said "Sergeant Hewer, you are safe that you are living, for that piece (pointing to the firelock) was loaded for you before." The prisoner was afterwards removed to the cage at Chatham. As we were going there some one asked me if the sergeant was dead who was shot. I said "No, not when I left the barracks." The prisoner said "If he is not dead, I hope he will soon die, for I am not afraid of the rope." The firelock must have been loaded before the parade. The deceased was orderly-sergeant. It is usual for that officer to desire a soldier to step from the ranks and go through his facings if he suspects him to be intoxicated. The deceased died about two hours afterwards. Cross examined by Mr. Bodkin - The prisoner staggered, and was not fit to be in the ranks. It was about half and hour from the time the gun was fired to the time of the removal of the prisoner to the black-hole. What he said was whilst under the influence of alcohol. Two corporals were present when the prisoner spoke to me. On ordinary guard the soldiers have the flints, and on convict guard their pieces are loaded. The prisoner would take his turn on convict guard. The charge in the gun must have been from some former loading. Any man, unless he were in drink, would expect his gun to be unloaded on parade. The flint in the prisoner's gun might have been on inspection. The prisoner threw the firelock from the shouldering to the loading position in the same manner as soldiers are drilled to do. The loading position is not that to fire from. He had hold of the firelock with both hands, and his forefinger on the trigger. There was a second or a second and a half from the time he coked the piece to the time he fired it. He was in the act of raising it. He raised it and fired. I consider he was in the act of raising it to the 'present' when it went off. He had made use of no language against the deceased up to the time of firing it. William Thornburgh, a corporal in the same regiment, confirmed the evidence of the last witness without any material variants. He added, that the prisoner told the last witness the firelock had been loaded for him, but he had got better. The firelock was steady when it went off, in his (witness's) opinion. In cross-examination he said it was all the work of a moment. If the last witness had ordered the prisoner to load his piece, it would have been his duty to do so. Edward Falls, another corporal of the 50th, was called, who deposed precisely to the same facts. Patrick Macguire, a sergeant in the 21st Regiment, examined - I knew the deceased, Patrick Feeney. I went with him to the hospital on the 9th of this month. I saw a surgeon attend him; It was Surgeon Campbell. Mr. Campbell, the staff assistant-surgeon at Chatham barracks, examined - On the afternoon of the 9th of the present month, having heard a shot fired, I went to the hospital, where I found a sergeant of the 50th Regiment wounded about two inches above the naval, a little to the right of the menial line of the body. It was a circular wound, from an inch to and inch and a half in circumference, as it, from some deadly projectile, passing through the body, penetrating the liver in its passage, and making its exit between the eighth and ninth ribs. I cannot say precisely what wound; it appeared a gun-shot wound, but much larger than I should have expected from a gun-shot wound. Feeney died in about an hour and three quarters. In my opinion that wound was the cause of his death. Cross examined - A musket without a bal fired so near a person could not produce such a wound, I have not seen such a wound as that produced from mere powder and wadding. I have not head of wounds being fatal from wadding and powder fired from a musket. I think the ball struck the button, and that, with the ball, in my opinion, produced the wound. I found a piece of the button in the wound. Re-examined - I do not think a piece loaded with mere powder and wadding, fired four yards from the deceased, could have forced the button into the body. The first witness having stated that the musket was fired in the loading position, was called back to explain that expression, which he did by stating that some officers called it the 'priming' and some the 'loading' position. Mr. Bodkin then submitted some legal objections on behalf of the prisoner. The first count alleged the wound to have been inflicted by a gun loaded with gunpowder and a leaden bullet. The evidence of the surgeon went rather (?) to negative the fact of a bullet having passed through the body, and no bullet whatever had been found. The second count charged the wound to have been inflicted by a certain gun loaded with gunpowder and other 'destructive materials.' He submitted this was bad from uncertainty. The same count charged the death to have been occasioned by the 'means aforesaid,' which also was uncertain, it not appearing to which means reference was intended. Mr. Espinasse, in answer to these objections, submitted that there was sufficient evidence to go to the jury that death was occasioned by a gun-shot wound. The words 'destructive materials' were sufficient, inasmuch as the 'gun' was charged as the instrument of death. As to the last objection, he contended the word 'aforesaid' referred to its immediate antecedent. The prisoner being called upon for his defence, handed in a paper, which was read as follows - "My Lords and gentlemen of the Jury, I beg humbly to state I did not know the gun was loaded, I was so drunk I did not know what I said or did. I did not owe the deceased any animosity or illwill; and I most deeply deplore the accident, and am ashamed of the expression, which, in a moment of intoxication, it appeared I made use of." Mr. Justice Littledale having read over the evidence, told the jury the question for their consideration was, whether the musket went off by accident or was discharged by the prisoner with a deadly purpose. As to the state of intoxication in which the prisoner was a the time, they would judge if the language he used later the melancholy event was expressive of his real sentiments towards the deceased. The fact of drunkenness was of course no excuse in the eye of the law. Should they be of opinion that it had been discharged intentionally, they would then have to say if the death had been caused by a bullet. He thought the indictment sufficient, should it appear to them that the wound was occasioned either by a ball or by destructive materials. The jury, after consulting for about five minutes, returned a verdict of Guilty. The foreman added "We think the musket was loaded with a bullet." His Lordship expressed his entire concurrence in the verdict, and proceeded to pass sentence of death with the usual solemnity. He remarked that if there had been any doubt about the murderous act it must have been wholly removed by the expressions which followed. The circumstance of coming to parade with a loaded musket showed that he had come there with premeditation. He then directed the prisoner to be taken o Monday next to a place of execution. The prisoner, who is a tall hardfeatured man of dark complexion, stood throughout the trial and whilst sentence was being pronounced with remarkable firmness. The execution, it is said, will take place in Chatham barracks. Alleged Murder - On Wednesday afternoon a great sensation was produced in Chatham and neighbourhood, in consequence of a soldier shooting his sergeant when on duty. The name of the deceased was Patrick Feeney; he belonged to the 50th Regiment of Foot, and the soldier, Benjamin Gardner, was a private in the same regiment. Mr Hinde, the coroner, and a respectable jury, held an inquest on the body. The first witness called was Sergeant Hewer, who stated that on Wednesday afternoon, between 4 and 5 o'clock, as the Grenadier company was at evening parade, the prisoner, Benjamin Gardner, was observed by Sergeant Feeney, the deceased, who was exercising the company, not to be so steady in the ranks as usual, upon which he ordered him to advance two paces in front, with a view to ascertain if he was sober. He gave the words "right about face," which the prisoner obeyed, but staggered in doing so. Not satisfied with his manner, and wishing to give him an opportunity to correct himself, he gave the words "left about face," the prisoner again staggered, and it was obvious he was in liquor. The sergeant then called a corporal and told him to take the prisoner to the guardroom, upon which he instantly bought his musket to a priming position and fired. The sergeant fell, and upon being raised was found to have received a musket-ball in his right side. Which had taken an oblique direction and passed out under the ribs. The sergeant survived only about two hours. By the Coroner - It was evident he intended this mischief for some one, as it was contrary to orders for muskets to be loaded whilst on parade duty; and the prisoner admitted, when on his way to the guard-room, that he had a fortnight ago loaded his gun to shoot witness, but he had latterly thought witness had got better; but he did not regret what he had done, as he had rid the world of a tyrant and a scoundrel. The fact, however, turned out in the course of the examination to be, that the deceased was a remarkably mild and humane man. A verdict of "Wilful Murder" was returned, and the prisoner was committed to Maidstone Gaol to await his trial. He had been formally in the royal Marines, but his character was so bad that he was drummed out of the corps. Just to add a bit of info to the 'New' Cemetery. The 'old' original cemetery was clustered in traditional style around the Parish Church of St Mary's opposite Fort Amherst which was where the original village of Chatham was. As Chatham grew the cemetery became over-populated! In the end the Board of Ordnance signed over a piece of land to the local authority that became the New Cemetery, now Town Hall Gardens; not to be confused with the Military Cemetery further up the hill on what is now the car park below Fort Amherst. The memorial stone to Sgt Patrick Feeney in the entrance porch to Town hall Gardens, currently has painted graffitti over it. It's such a shame some people have no respect for property or history. Sergeant Feeney was inspecting and drilling the Grenadier company at four thirty in the afternoon. Feeney noticed that Gardiner was staggering and "not so steady in the ranks as usual." Suspecting that he had been drinking, Sgt Feenet ordered him to take two steps forward, then right about face, during which Gardiner was observed to stagger. Gardiner was ordered to left about face again Gardnier was seen to stagger. Feeney then called to Corporal Dunelly to take Gardiner to the guardroom. Upon the order being given Gardiner brought his musket to his shoulder, cocked it and aimed point blank at Sergeant Feeney and fired. Sergeant Feeney fell to his knees and Gardiner was disarmed and taken to the guardroom, on the way he was heard to utter "I have rid the world of a rascal and tyrant and i am ready to die for it". A short time later Gardiner was taken to the civil lockup in Cage Lane Chatham, where on learning that Feeney was not yet dead (he died about two hours later) said to a later witness "if he is not yet dead i hope he will soon be, for i am not afraid of the rope". An inquest was held in Rochester the next day presided over by Mr Hinde the Coroner, the verdict reached by the coroner jury was death by wilful murder. The coroner concluded that it was evident that Gardiner "intended this mischief for someone" as the musket was primed and loaded on parade which was strictly contradictory to orders. Among witnesses called was Thomas Campbell as assistant surgeon at Chatham Barracks, who described Feeney's wound as about two inches above the naval slightly to the right, being circular and about an inch and a half in diameter. The ball passed through the ribs and penetrated the liver. Gardiner was commited to trial at the assizes at Maidstone and was to be held in the county gaol. The trial was held two weeks later where the account of the murder was given by the principle witness Sergeant George Hewer who had witnessed the whole incident. In his defence Gardiner stated he was not aware that the musket was loaded and that the incident had only occurred because "I was in a state of intoxication when the piece went off and did not know what i did or said". In his summing up the Judge said it would be up to the jury to determine if the gun went off by accident or not. It took the jury just five minutes to find Gardiner guilty of murder. Sentence of death was passed to be carried out on Monday 28th July, later stayed until Thursday 31st. On the day of the execution Gardiner was taken from Maidstone by the civil authorities and about a mile from the town placed in a cart and handed over to the military authorities. The wagon attended by the County Under Sheriff, was drawn through the town and out onto the Chatham Lines were the gallows had been erected. The troops of the Garrison were formed up on the ramparts to witness the execution. Despite it being very bad weather a great crows of local people, many of them women, had gathered to watch the hanging. On the platform gardiner joined in prayers with the prison chaplain before making his final statement. "Gentlemen I am guilty of the crime for which i am about to suffer, and I am sorry for it. I beg also to state that unless it had been for a drink I should not be here today, I dare say". The local paper of the time reported "Owing to the weight of his fellers the suffering of malefactor were of short duration". After an hour his body was cut down, placed in a coffin, and taken to Maidstone Gaol to be buried in an unmarked grave. 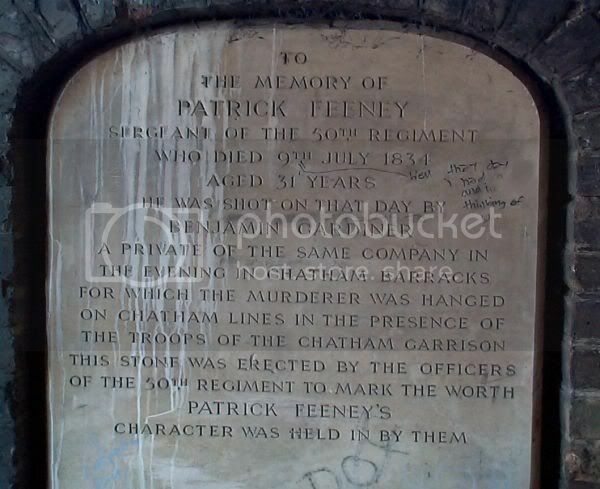 Patrick Feeney was buried in the town cemetery at Chatham, where a memorial plaque erected by subscription from officers of the 50th Regiment can still be seen within the entrance porch of what is now known as the Town Hall Gardens. Taken from a book called Military Punishment in the Chatham Garrison During the 19th Century by Keith R, Gulvin.